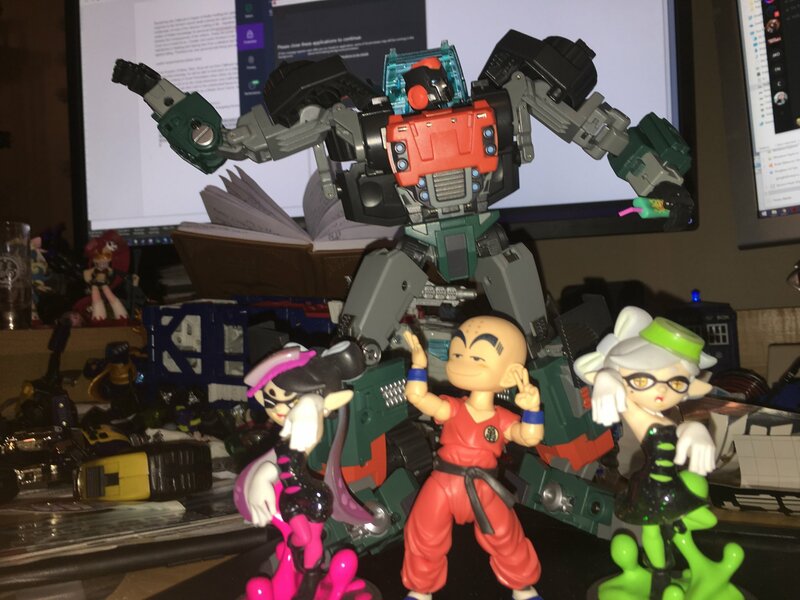 I’ve seen people on certain major Transformers forums whining about MMC. And all the redecoes/retools they’ve put out in the last year. And I won’t deny it’s a lot. But A) you don’t have to buy them, B) retools/repaints are a way to recoup mold costs/create seed money to cover upfront costs for new tooling, C) take a look at their upcoming slate for 2019 and all the new molds within, D) you don’t have to buy them, E) YOU DON’T HAVE TO BUY THEM. Just checking out altmode, it’s a fairly involved retool of the already very involved retool of the Collisus (Thunderclash) retool of Kultur. 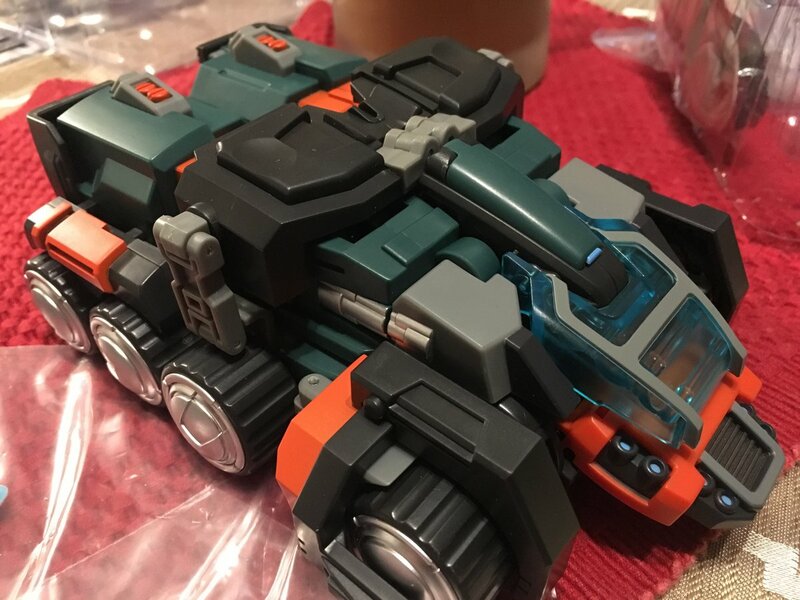 While it’s also an eightwheeler, lots of parts have been clearly changed (I’ll do the rundown in the botmode section), and the clear windshield is a really nice touch that helps sell the “it’s Roller” of the retool. Unlike all the other iterations, he looks like he can actually carry passengers in theory. While not accurate, it’s on the level of a Hasbro “this comic design is neat so let’s use it as the basis for a new toy with a different altmode” that we saw a lot of around 2012 or so. Even bigger than a giant mug! 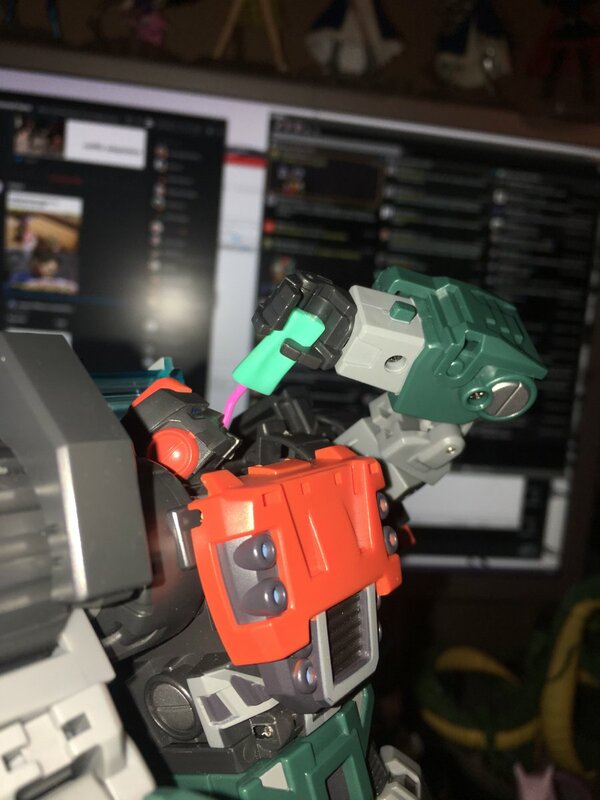 Botmode, naturally, is where this toy REALLY shines, though. As they retooled a LOT for this version of the mold, even just comparing him to Collisus – back kibble, cockpit, chest, head, shoulder kibble, knee kibble, and toes have ALL been retooled to bring him closer to Roller’s character design in the IDW comics. As with all the other iterations of the mold, he’s got a killer amount of range in his posability. The head sculpt is pretty darn bang-on, and the color layout is a pretty great match for Roller’s comic art. 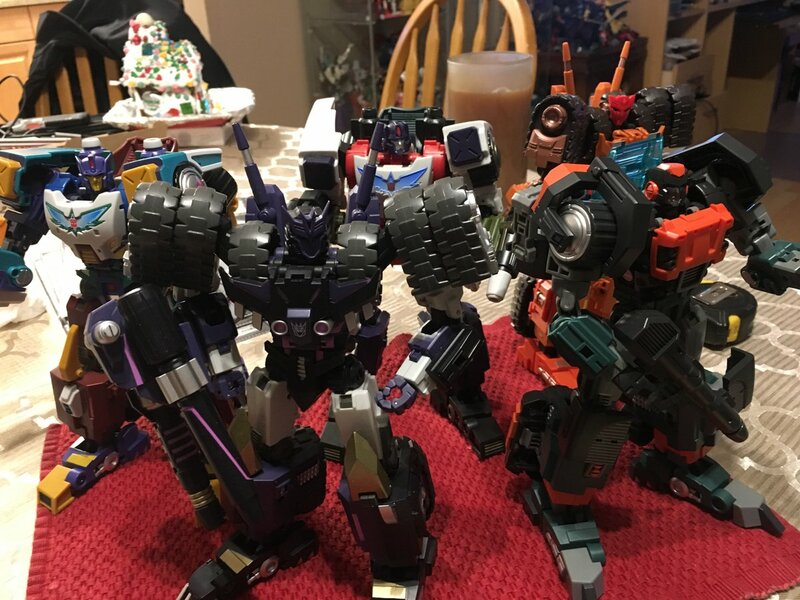 As one can tell in the group photo, while he shares a LOT of parts with Tarn and Thunderclash he’s very much got enough changes to give him his own distinct visual identity. Accessories aren’t that numerous, but he’s got what he NEEDS – the rifle originally tooled for the Machine Wars Optimus Prime version of Collisus (which, interestingly, uses a DIFFERENT attachment point, showing some forward thinking on that mold!) and the most important accessory…. the Kremzeek juice box he’s always holding. If he hadn’t come with that, it would have been a travesty, but he does, and while it’s a little tricky to get in, it’s sculpted to fit in his hand in a “has been squeezing the juice out of it” shape. A necessary accessory for most robot mode posing you’re gonna want to do with this guy, indeed. Anyway, end conclusion? Posable toy, and a solid use of the mold. 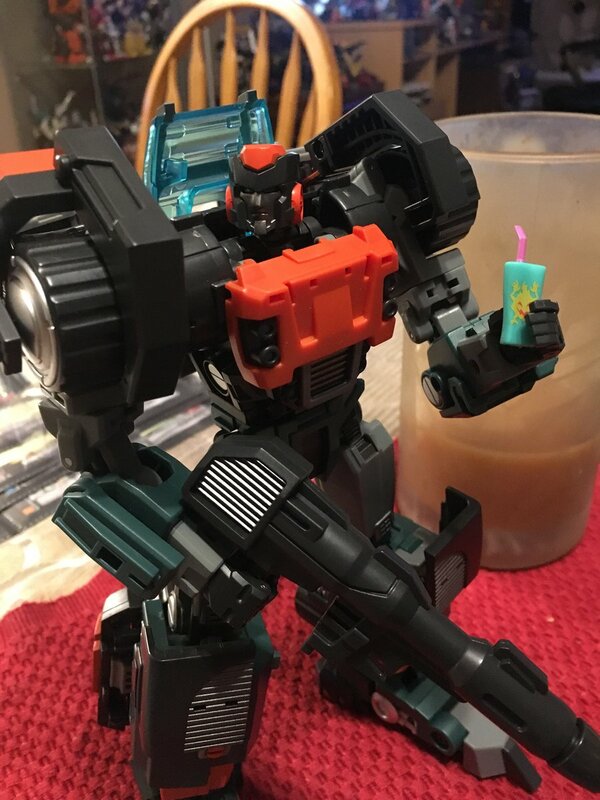 If you’re hung up on comic accuracy to altmode/botmode, you may want to wait for the Roller FansProject is doing, but if you want something without a breastmaster gimmick and with a good solid large size, decently accurate botmode, and proven QC track record, the MMC one is for you.